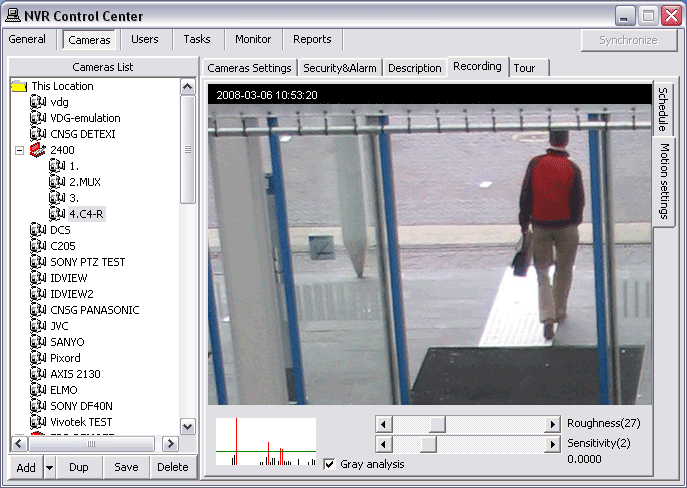 Video motion detection (VMD) is the original, most basic and prevalent intelligent video analysis in video surveillance. Video motion detection is a key function in the DETEXI NVR. It is a way of defining activity in a scene by analyzing image data and differences in a series of images. Using the NVR motion detection functionality alleviates the workload for any recording devices in the system. It also reduces the use of bandwidth, in addition to storage space, and makes event-driven surveillance possible because no video (or only low-frame-rate video) is sent to the operator or recording system unless activity is detected in a scene. The NVR provides the video motion detection functionality even to the network cameras that do not have this as a built-in feature. 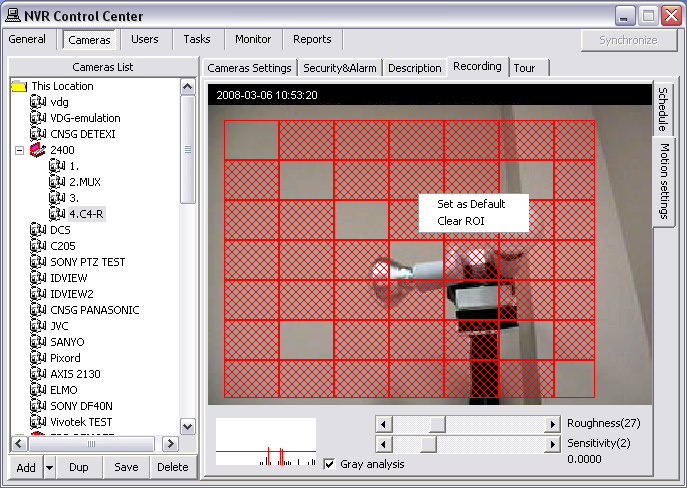 This means that a network camera will send video to the NVR software for analysis. Motion can be detected in any area of an image. In addition, users may be able to set different motion detection sensitivities. Using VMD helps in prioritizing recordings, and making searching for events easier. Motion detected data can be included in a video stream to simplify activity searches in the recorded material (scheduled with motion detection type of recording). Once motion is detected, the NVR can trigger an external device (such as a door to open or close, a light to turn on or off), initiate recordings from selected cameras, and send e-mail alerts. Alerts also can be triggered if motion stops. Motion can be detected in any area of an image. In addition, users may be able to set different motion detection sensitivities. When a recording schedule has motion detection enabled, the Motion Settings become available to the user. These settings are not required, but can be used to optimize motion detection for each individual camera and its environment. Motion settings apply only to the currently selected recording schedule, allowing different motion settings to be applied to different times of day and levels of light. A set of motion settings can be defined as the default, which will automatically apply to all new schedules created for that camera. In the NVR Control Center — Cameras select camera to configure from the Cameras List and switch to Recording. Select a recording schedule with motion detection and switch to Motion Settings right side tab.